Creative hobbies like painting, quilting, pottery or woodworking could help keep your brain sharp as you get older. A new study from researchers at the Mayo Clinic looked at the benefits of a number of activities in middle and old age and found that engaging in a creative hobby helped reduce the risk of dementia and preserve memory. In addition to arts and crafts, the study, published Wednesday in the journal Neurology, also examined the longterm benefits of social activities such as book clubs, movies, concerts, time with friends and travel. Additionally, the study considered the brain-health benefits of computer pastimes such as surfing the Internet, playing video games and even online shopping. All of them helped -- but artistic pursuits seemed to be most effective. "There's enough data here to suggest that being socially, mentally active -- along with what we know from other research, physically active -- probably does influence whether you're going to get dementia down the line. And you can reduce your risk by being mentally and physically active," said Dr. James Leverenz, a neurologist at the Cleveland Clinic's Lou Ruvo Center for Brain Health, said in a video press release. The researchers surveyed 256 people with an average age of 87 about how they used their leisure time. At the start of the study none of the participants were found to have memory or thinking problem. In follow-up assessments approximately four years later, 121 people had developed mild cognitive impairment. The researchers found participants who engaged in artistic hobbies such as painting, drawing or sculpture in both middle and old age were 73 percent less likely to develop mild cognitive impairment than those who didn't. 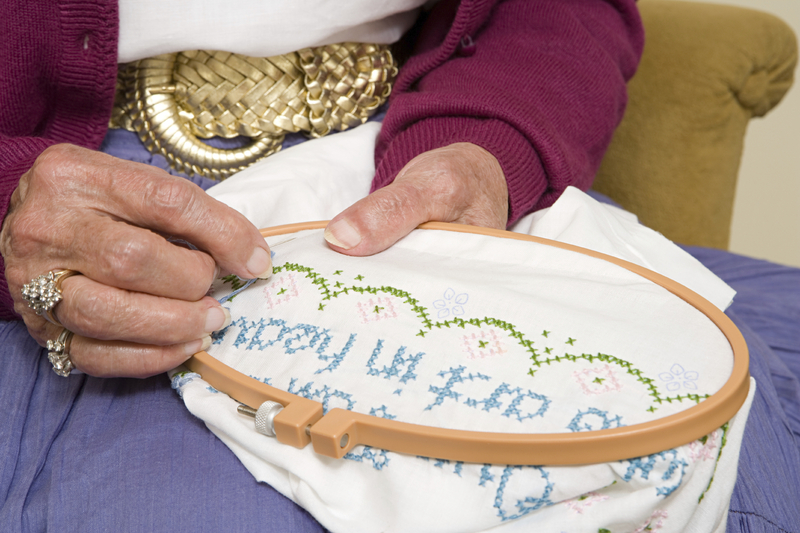 Those who crafted -- doing things like pottery, woodworking, quilting or sewing -- were 45 percent less likely to develop mild cognitive impairment. Social activities also made a difference. People who socialized and did group activities in middle and old age were 55 percent less likely to develop mild cognitive impairment compared to those who did not. Finally, the study found people who regularly used a computer reduced their risk of mild cognitive impairment by 53 percent. "Many investigators theorize that stimulating the brain through mental and physical activity increases growth factors that help brain cells function better and prevent them from dying," Leverenz told CBS News in an email. The authors of the study say that in order for such hobbies to provide a protective benefit for cognitive function, a person must begin them in middle age. Previous research has shown that regular exercise and engaging in mentally challenging activities like crossword puzzles or learning new skills can also help stave off memory loss. However, even with stimulating activities, people with certain chronic health conditions such as high blood pressure in middle age and depression still had a higher risk for mild cognitive impairment. The National Institute on Aging, the Mayo Foundation for Medical and the Rochester Epidemiology 53 Project supported this study.